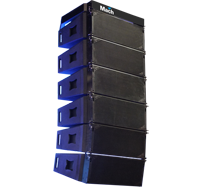 The WLA is loaded with double 10" LF, double 8" MF and two high frequency drivers. Each enclosure is constructed of high grade birch ply-wood and is custom fitted with steel fly hardware hanging up to 12 enclosures in a single array. Our user friendly hardware also allows the user to stack up to 6 enclosures. Ballister is design to work as sub with WLA which combines high output with low-Q design. Power handling is solid 1KW AES. Drivers (neodymium magnet) LF 2 × 10" MF 2 × 8" HF 2 × 1"